Golden State Warriors Are Good at Basketball, Terrible at Singing - trendistic.com: ever tried. ever failed. no matter. try again. fail again. fail better. Basketball season is upon us and rookie hazing is in full swing. 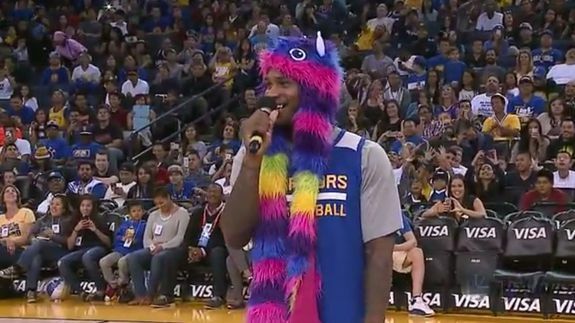 The Golden State Warriors’ rookie class of 2014 were subjected to a unique form of public hazing during an open practice this week: Putting on costumes and turning the Oracle Arena into an a cappella karaoke studio. James Michael McAdoo sang the theme from the Fresh Prince of Bel Air (2:45), Aaron Craft sang “Party in The USA” (8:14) and Draymond Green — well, Draymond Green didn’t do much except annoy the crowd (5:45). TL;DR: Basketball needs to start already. Was the Amazon Fire Phone a Gross Miscalculation?